It’s been 40 years since I wrote a book about my friend Eugene George Standingbear, a remarkable Native American from the Lakota (Oglalla Sioux) tribe in South Dakota. It was a good friendship but a brief and unlikely one. At 71, Mr Standingbear had experienced a full life of agony and ecstasy in a vastly changing America. I was still in my 20s, fresh out of the Navy, finishing up college, and working on various weekly newspapers here in Colorado. Now as I approach my own 70th year, with my own lifetime full of experiences (especially my afterlife research! ), I’m feeling a closer affinity to Eugene, so it’s a genuine honor to be able to polish up his amazing story and, in the noblest of Lakota traditions, to give it to someone who benefited from Eugene’s life on Earth. 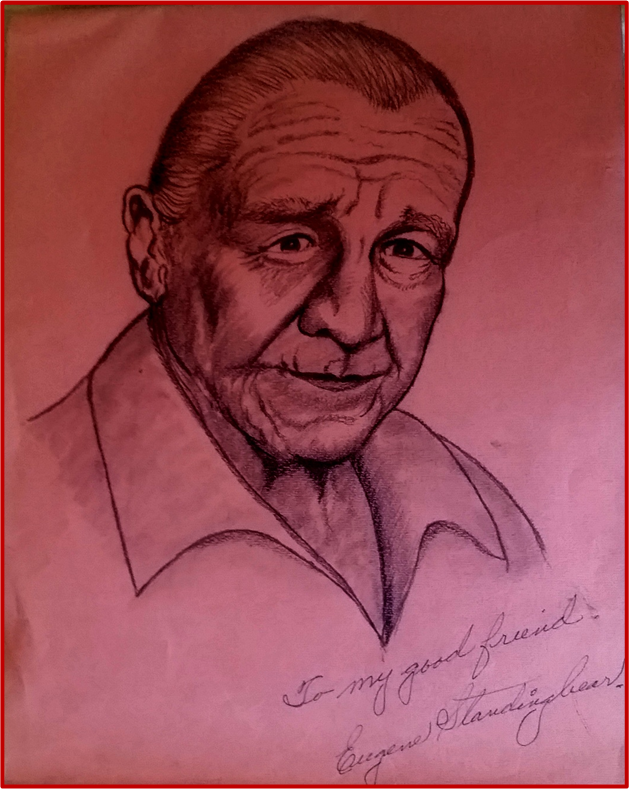 Gene Standingbear self-portrait for the author. Pencil sketch. That someone, of course, is humanity. Is the world a better place because of Eugene Standingbear? I think it is. I believe the world is improved by anyone who survives the rigors of this world, finds peace and understanding, and spends the rest of his life spreading that peace and understanding. Wolakota…. When I met Eugene he had reconciled a lifelong conflict between his native spirituality and Christianity, between Lakota values and American values, and he was busy painting pictures of the way life used to be for his people. He wanted to help preserve his native culture. Though Eugene was born in 1906, his story really began five centuries earlier, when European explorers crossed “the green sea of darkness” to find peaceful native cultures in the Americas flourishing amid vast reserves of gold, silver, and gems… and exploration quickly became exploitation as shipload after shipload of treasure seekers from Europe flooded to the New World in the coming centuries. Eugene and his people were directly caught up in that drama that shaped modern civilization. Through Eugene’s story we get a clearer picture of how the term “noble savage” applies to the life of Mr Standingbear and to the Native American people. It’s not the romanticized view that grew out of the ideas of Jean Jacques Rousseau—of peaceful people living in harmony with nature, then uprooted by a steamroller civilization. There was a part of me 40 years ago that wanted to see Eugene and his people that way, but his stories were at odds with the ideal. Noble values include love, honesty, trust, good will, concern for the less fortunate, service to the community, and the betterment of humanity. These are the values that motivate the finer spirit within all of us… and promote peace and order in human affairs. Savage values include fear, deception, mistrust, contempt, selfishness, thievery, and callousness. These are the values that motivate our hormone-driven outer shell, our carnal body… and stir up conflict and chaos in human affairs. From that I think it’s fair to draw certain conclusions, for example, that traditional Lakota culture—with its giveaway ceremonies and one-step-closer relationships (tribe members are like cousins, cousins are like siblings…) that foster equality, fairness, peace, and order in society—is nobler than, say, democratic capitalism, which celebrates diversity and personal gain that inevitably lead to envy, greed, disparity and conflict. Ideas like that might be sprinkled into the story as I polish it up in the coming months, but I’ll make sure they don’t distract from Eugene Standingbear’s story. The intent of these little side discussions will be comparison, not judgment. Eugene Standingbear was never a leader of his people—a chief—though there were early signs (his athletic prowess, his charisma, his family lineage, the influences of his mother and his Uncle White Bull…) to indicate that he might have become a Lakota chief, had he so chosen. But his destiny and restless nature carried him off the reservation into American society… for better or worse. On the other hand, white people often called him Chief, as in, “Hey, Chief…” which is like saying to someone on the streets of America, “Hey, Mr President…” or maybe, “Hey, Boss…”. It shows a general disregard for Native American tradition. Our material world is superimposed by many invisible spirit worlds flourishing with spiritual life. All of these worlds are created and sustained by a living central source that emits pure, perfect consciousness. That creative consciousness and its source are the reality. The many universes look and feel real to their inhabitants, but they are just illusions. That central source goes by many names. The Lakotas call it Wakan Tanka and Great Mystery. Christians call it God. Muslims call it Allah. Hindus call it Brahman. That’s the crux of human spirituality on Earth: Humans living on Earth, God at the center of everything and at the center of every person, and the many spirits in between, who range in character from the brilliant and divine (probably trillions of them spinning off the source) to the malevolent and grotesque (maybe a few thousand of them created by the darkest of human thoughts and the most ghastly human behavior here on Earth), with many, many shades of spirits in between. As you’ll see, Eugene’s life was spiritually rich, from the noble spirit of Chief American Horse chasing him home after the burial to protect his bundle of sacred dancing clothes, to his stint at Santee Bible School where Indian teens were trained to become Christian missionaries who’d return to their reservations to spread the good word. Through it all, Gene remained attached to Wakan Tanka… to God… even through the darkest of times when the connection grew thin and weak, and he clung to life by a thread. This entry was posted in Uncategorized and tagged Indian schools, native american spirituality, wakan tanka. Bookmark the permalink. Well done , Mark, and very meaningful! John, I think that captures the gist of human spirituality. Thanks!